This recipe is based on drumsticks - which I must admit I had never purchased until I shifted to Mumbai, thanks to my neighbors in the small town I spent my childhood days. While we didn't have much of a garden to talk about but our neighbors had planted various trees and plants including that of drumsticks. We used to source their home grown drumsticks at least twice a week and my mom used to make amazing stir fry,curry and podi with those drumstick greens. 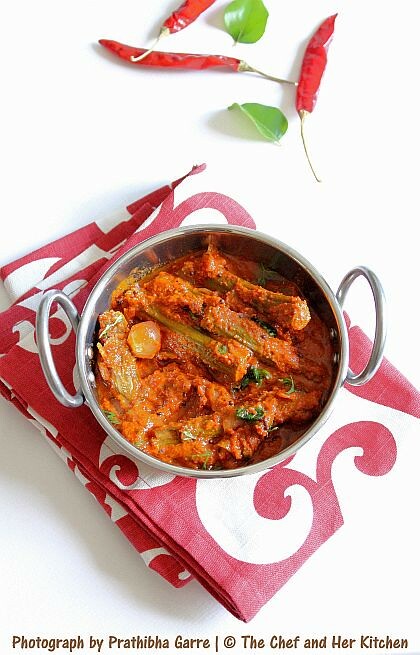 I must say the drumstick greens are very flavorful and tasty and you can even use them in making adai, rotti, dosa and paniyaram.While drumstick sambar was one of the usual fare and also our family's favorite, drumstick masala is another recipe which we were really fond of. Apart from these, I dont think my mom used to prepare any other variations. I however, experiment with a lot of varieties and use it in lots of gravies, sambar, rasam, raita, gojju to name a few. Drumstick has a peculiar taste and flavor which I really like. 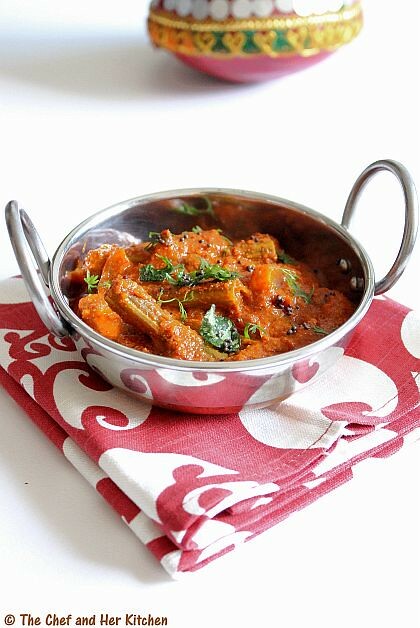 Drumstick sambar is my most favorite one till date and I make it quite often.Drumstick masala is another one I like and for this one needs tender drumsticks. I didn't make this recipe for a long time, as I was not sure how my hubby would react to this dish.When I found some tender drumsticks, I picked them up to make this and surprisingly he loved it and asked me as to why I never prepared this before. In fact he even asked me for a second serving even though his favorite bitter gourd curry had also featured in the menu that day(I have already mentioned about his liking for bitter gourds in this post).I am sure I have convinced you enough, to try this recipe, this is truly a lip smacking gravy which goes very well with hot steamed rice and as well as rotis,but I prefer with rice usually. Dry roast coriander seeds and red chillies separately and keep them aside.In the same pan warm cinnamon,grated dry coconut and keep aside.Let the mixture cool. Grind all the roasted ingredients to a fine powder and add garlic and tomatoes to it and grind to a very fine paste. Clean and cut drumsticks to 2" long pieces. Heat 2 tbsp oil in a kadai and add cut drumstick pieces and fry them well for 3-4 mins. Add shallots or sliced onions at this stage and fry them again for 2 mins.Reduce the flame and cover the kadai with a deep plate and pour some water over it and let the drumstick cook over a steam for 7-8 mins. Add the ground paste to the cooked drumsticks and fry well for a couple of minutes and add tamarind pulp and enough water to get a gravy consistency,add enough salt and cover it and cook for 5-6 mins until the gravy is cooked and the oil starts floating over the gravy. Meanwhile in a small tadka pan heat ghee/oil and crackle mustard seeds and add curry leaves and fry for 30 seconds and pour this tempering over the drumstick gravy. 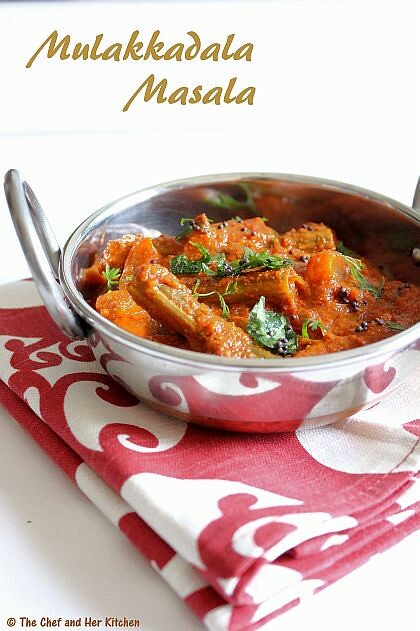 Serve it hot with hot rice and ghee with some fry/fryums/papad.You can also serve it with rotis. 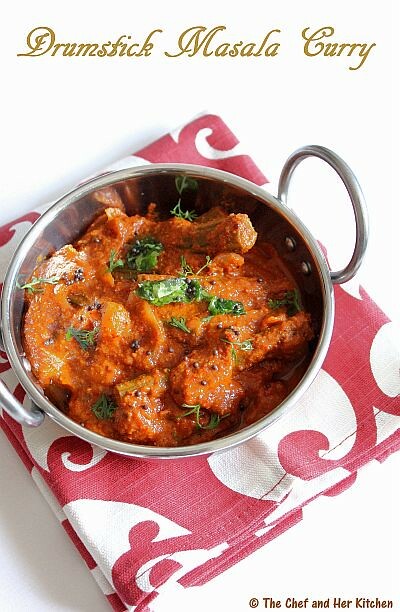 Always select nice and tender drumsticks for full flavor of the curry. Add red chillies according to your spice levels.If the gravy is very tangy add a bit of grated jaggery or sugar to it. For a Vegan version,use oil instead of ghee in the recipe. Simply yummy looking drumsticks masala.Looks awesome. This definitely looks awesome Pratibha.. so sad that we don't get drumsticks in Brazil..I love them so much in sambar too. Looks colorful, and superb clicks. Wow this is so very flavourful Different from what I make. Love it. wow, it has been ages since I had mulakkada, love it. Beautiful click, it looks delicious. Woww... delicious and tempting recipe.. looks absolutely inviting.. thanks for sharing !! Yours looks so yum! I dont get drumsticks that often here... WOuld love some now though! Nice one and absolutely miss good fresh drumstick.. way too tempting. This looks so scrumptious Prathy. I too make it but somewhat differently. I love Drumsticks. Nice drumstick curry.Love the color a lot. Curry looks super irresistible and fingerlicking.. Cannot beat drumstick masala. It is so comforting and tempting to look at your photos. I love drumsticks. I gives a unique flavour in the curry, Sambhar etc. Thks for the lovely recipe. will try it. when to add tamarind pulp? Where do I buy drumstick s in england? ?